On this page a global description is given of the main functions of the Aniseikonia Inspector. More detailed information about the features of the Aniseikonia Inspector can be found in the manual (pdf, 2.3 MB). The aniseikonia test of the Aniseikonia Inspector is based on the direct-comparison method. The patient sits approximately 40-50 cm (1-2 feet) away from the computer screen looking through red/green glasses for the binocular separation. The computer screen shows a series of color-optimized red and green comparison targets. The patient's task is to simply identify for each presentation which comparison target is perceived as larger. Due to the interactive capabilities of a computer, the aniseikonia of the patient is determined using an automatic adaptive forced-choice procedure and maximum likelihood analysis. It also allows for compensation of possible fixation disparities. Custom User defined testing of aniseikonia directions and field angles. 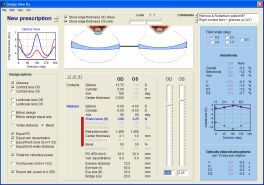 All prescription parameters that affect the magnification of spectacle lenses (e.g. base curve, lens thickness, refractive index, and vertex distance) can easily be changed using slider bars. The resultant aniseikonia (as well as optically induced anisophoria) are shown in real-time when changing the prescription, making it real easy to design a new prescription that will correct the aniseikonia. Furthermore, images of the lenses and graphs of the edge thickness are shown to help you determine if the lenses will fit in the frame and to evaluate the cosmetic implications. Two different print-outs are available: 1) with all the prescription and design information, and 2) with just the iseikonic prescription presented in an easy way for ordering the lenses in an optical shop. There might be reasons why you would like to consult Optical Diagnostics about a patient. To facilitate the consulting, the Aniseikonia Inspector contains a function to 1) send the (anonymized) patient data to Dr. de Wit of Optical Diagnostics, and 2) to download back into the program iseikonic prescriptions designed by Dr. de Wit. Consulting fees may apply.